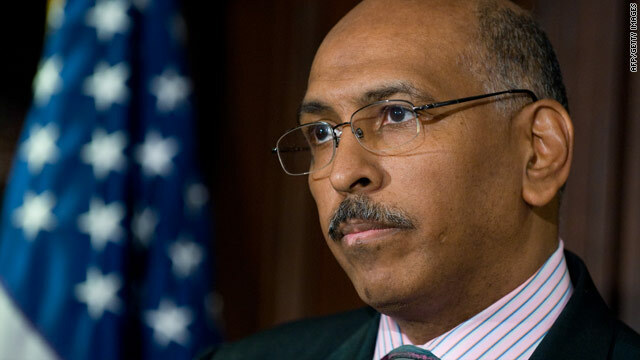 Republican National Committee Chairman Michael Steele is under fire from members of his own party. Washington (CNN) -- GOP tempers flared during a routine conference call when House and Senate leadership aides confronted Republican National Committee staffers over recent comments by party chairman Michael Steele. At issue was Steele's prediction earlier this week during his nationwide book tour that the Republican Party would not take back the House in November -- comments that infuriated Republican strategists on Capitol Hill, who decided to broach the topic during the Wednesday call. The dispute -- first reported by Hotline On Call -- occurred on a daily strategy call with aides from Republican leadership offices in the House and Senate, along with RNC officials. According to a senior House aide who was on the conference call, a Senate staffer said the chairman was trampling on the GOP's message in a week that saw several high-profile Democratic retirements. The Senate aide told RNC staffers to do a better job controlling their chairman. "He is digging himself deeper," the Senate aide griped about Steele, according to the House source. "He's got to stop and put an end to this thing." RNC Research Director Jeff Berkowitz jumped in and "offered a hard defense of Steele," according to the senior House aide. Berkowitz shot back that the Senate official was "out of line," which then set off a round of "bickering," the House aide told CNN. A House aide chimed in to express sympathy with the plight of Steele's advisers but said the chairman's remarks could do serious damage to fundraising, candidate recruiting and voter motivation ahead of the midterm elections. "You guys got to tell us how long this is going to last," the House aide said. "Our phones are ringing off the hook. He is putting our bosses in difficult positions." The call ended shortly thereafter. Asked for comment on the flare-up, RNC spokeswoman Gail Gitcho e-mailed: "Not commenting on staff calls." The senior House aide later told CNN that congressional Republicans have "confronted" Steele over the past year about some of his comments. "He has been confronted numerous times by Senate leaders and House leaders over the last year," the aide said. "They have confronted him about speaking about things he shouldn't be speaking about, whether it's Senate policy or House policy." "Today, he threw a temper tantrum and told people to shut up," the aide said, referring to an ABC interview in which Steele lashed out at his critics. "At this point, he needs to look in the mirror."